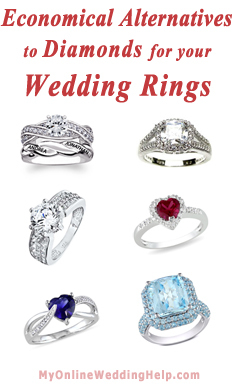 The stones making up your wedding rings go a long way in determining what you will pay. Each type of gemstone has a value that fluctuates according to whether it is natural or laboratory- made, its quality, and size. Luckily, this means many choices beyond expensive diamond rings. Many of us simply cannot justify the cost of real diamonds. Fortunately, cubic zirconium, otherwise known as CZ, has come a long way. Many of these man-made diamonds are indistinguishable from the real thing to the untrained eye. Savings Tip: Buy (a) cubic zirconium ring(s) to get the sparkly appearance without the cost. You can buy Diamonique or other CZ bridal ring sets and engagement rings for very little (many under $100 as of this writing). In fact it’s possible to purchase CZ in gold and other fine-metal settings for a few hundred dollars (versus several thousand for an actual diamond). These days, diamonds and CZ are not the only choice of stones for your rings. Gemstones have become common alternatives, chosen to add sentimental value, save money, or both. Savings Tip: Choose affordable gemstones to convey additional symbolism through the rings. Both the colors and particular stones can have a specific meaning. The most popular choices are rubies (red) and sapphires (blue). The red color of a ruby ring is long associated with love and romance, making it an obvious choice for a colored engagement ring, especially if one is to be married near Christmas or Valentine’s Day. As an alternative to natural rubies, some choose other red stones such as lab-created rubies or garnets. The blue of a sapphire is attributed to many different qualities, including purity of the soul, faithfulness, truth, purity, wisdom, constancy, sincerity, and divine favor. Man-made sapphires generally fall within a tight budget, as does blue topaz. Whatever you choose, remember it the thought and feeling behind the rings is much more meaningful than the price tag.